Killer Kangaroos and Demon Ducks? 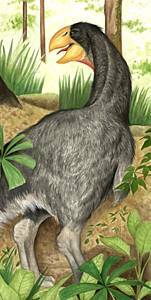 Lurid descriptions and media images like this are not likely to be an accurate source of data about creatures like this giant thunder bird, Bullockornis. They were possibly hunted to extinction by the early humans arriving post-Babel in Australia. Recent media reports claim that carnivorous ‘Killer Kangaroos’ powerful enough to ‘rip your arms off’ and huge flesh-eating birds dubbed ‘Demon Ducks of Doom’,1 have been discovered in the Riversleigh (Australia) fossil dig. However, Christians who believe in the Creator God of the Bible have little to fear from the notion of creatures such as these. While such creatures may indeed have existed, we need to remember that information concerning their habitats and lifestyles (as well as much of their physiology) remains largely hidden in the past, unable to be revealed by fossils alone. And more than that, the language used to describe them is mostly sensationalism designed to conjure up images in our minds which both excite and repulse us. They really are just a little bit of fact wrapped in a whole lot of story. It’s important to learn to separate fact from interpretation. We can then see more clearly how those facts might fit our biblical worldview. The evolutionary interpretation of facts will rarely agree with what the Bible says, but the facts themselves always will when we start with the framework of history revealed in God’s Word. in virtually all cases is merely carrying a subset of the genetic information of the original kind from which it is descended. This means that the ‘structure and function boundaries’ of the various kinds were much broader at Creation than their descendant ‘species’ are now. A similar scenario applies to bears, too. All bears have sharp teeth and claws, but of the various types around the world today, all are largely herbivores (except the Polar Bear) despite each of them possessing the digestive system of, and being classified as, a ‘carnivore’. Polar Bears, though almost exclusively meat-eating, do include some plant food in their diet when available. In the pre-Fall world, no bears would have exhibited carnivory—see ‘Bears Across the World’. The Riversleigh deposit is almost certainly not just post-Fall, but post-Flood. The animals it reveals, like today’s tigers, are substantially removed from the Edenic world of their ancestors, the original Genesis kinds. We are all familiar with the adage that ‘familiarity breeds contempt’. Suppose our world included only small cats and someone found a fossil of a tiger. In their description of the creature they would possibly include: huge size, dagger-like teeth, needle-sharp claws and the ability to rip your arms off. Our unfamiliarity would make such a creature both unusual and grotesque in our imaginations. 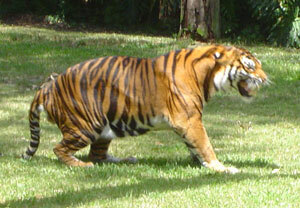 Earlier this year, I watched the tigers at an outdoor zoo (in Dubbo, New South Wales, Australia) for some time. I was fascinated by their movements, awed by their size, aware of their teeth and claws, convinced of their ability to rip my arms off and much comforted by the fence and the wide, water-filled moat between us. But at no time did I regard them as either unusual or grotesque. I am sure that if meat-eating kangaroos were a part of our everyday experience we would not find them unusual or grotesque either. Killer Kangaroos and Demon Ducks of Doom? Maybe! Carnivorous, even man-eaters? Maybe! But how I would love to have been around to see them ‘in the flesh’ rather than the imaginative polystyrene and fibreglass imitations we have today. Australia finds its lost animals, bbc.co.uk, 4 August 2006. Return to text. Galapagos Online: Birds of the Galapagos, galapagosonline.com, 4 August 2006. Return to text. ABC Natural History Unit—Islands of the Vampire Birds, abc.net.au, 4 August 2006. Return to text. See CMI’s The Creation Answers Book for a discussion of various mechanisms by which carnivory may have arisen in different types of creatures—not all canvassed here. Return to text. How do bad things come about?